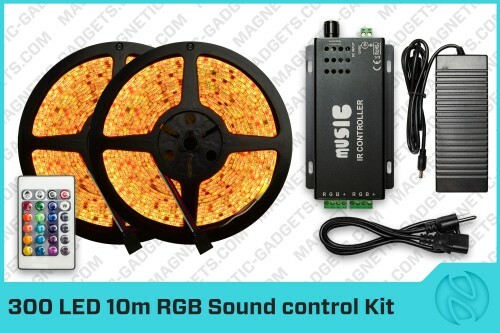 Control your multi-color RGB LED strip through music and take your RGB LED Strip to a completely new level. The LED Controller with sound control will change the colors of the RGB LED strip in sync with the beat of the music you are listening to. You can set the level of sound sensitivity to the surrounding sounds. The LED strip is completely flexible, you can twist it into any shape. LED strips offer creative options for upgrading the lighting of any room. Our LED strips can be used to set the mood in bedrooms, living rooms, conference rooms and office reception area. It’s also the coolest way to decorate any vehicle, bar and display counter. Our LED strips are self adhesive and connect with simple plug and play connectors. They are great for creating the perfect lighting for everyday living to party lighting. Important connection note: The colors on the 300 LED strip are in the following order: BRG. This essentially means that you need to cross the green and blue wires in order for the strip to work correctly. When connecting the strip, insert the blue wire in the G port and the green wire in the B port.